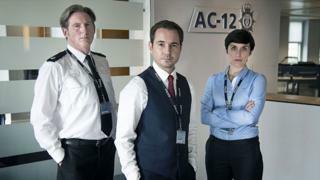 Line of Duty, BBC One's hit drama about police corruption, returns to our screens on Sunday 31 March, but if you haven't watched it before or need a reminder of the plot, look no further. The fifth series introduces Stephen Graham as John Corbett, aka "Balaclava Man", with Rochenda Sandall as his second-in-command. Realising his career is over, Tony takes his own life - but the corruption does not die with him. Another officer in his team, DS Matthew "Dot" Cottan (Craig Parkinson), is revealed to be an inside man for gangster John "Tommy" Hunter (Brian McCardle). Shocking moments: Tony's girlfriend Jackie (Gina McKee) having her throat cut; Arnott being tortured; Gates killing himself. It is later revealed that she's a pawn in a plan cooked up by Cottan and his criminal associates, who wanted Tommy silenced in order to protect Dot's secret identity. Finding the list and seeing Tommy Hunter's name on it, Cottan destroys it while making it look as if Steve is the mysterious "Caddy". Shocking moments: Danny's death scene; Cottan killing Denton; Cottan taking a bullet for Fleming. Huntley has to have her hand amputated and is arrested for killing Tim Ifield. Her solicitor is found to be linked to "Balaclava Man" - as is Huntley's boss, Assistant Chief Constable Derek Hilton. A recording of Cottan's deathbed declaration reveals he was promoted by a corrupt copper whose name begins with H. Is this the newly deceased Hilton... or could it be Ted Hastings? Shocking moments: Huntley and Ifield's fight; Arnott being attacked.